One of the high points for the ereader market in 2010 was the rise and fall of Samsung. They epitomized all the changes that happened in 2010. But this isn't a history of Samsung's ereaders; it's a review of one ebook reader, the Samsung E65. This is a 6" model that I'd been trying to get my hands on for (literally) a year and a half. This model has largely been discontinued (I got it on clearance), so there's little chance that you might buy one. But the device has some interesting details that I wanted to cover in any case. I wouldn't recommend buying this ebook reader. It's rather expensive, and even on clearance it cost me 150 euros (close to $300). There are much cheaper options on the market (Sony, Kindle, Nook, Pocketbook). Folks, it's my belief that if I'm going to spend $300 on an ebook reader, I might as well get an Android tablet. It's a better return on the investment. Update: Someone commented that it's still on the market and can be found in Germany for 139 euros, same as the Kindle. I'd still get the Kindle. The E65 debuted at CES 2010, and here is a partial list of specs. 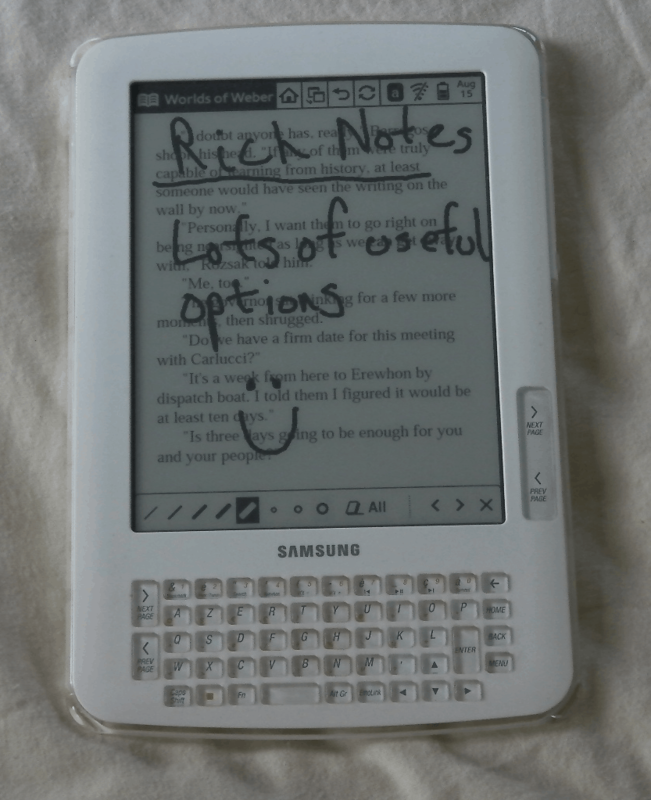 As you can see from the photos, this is clearly a Kindle clone.The shell is a glossy white, and that finish does make certain activities (like removing the back cover) difficult. The E65 also has a touchscreen, and it does come with a sketchpad app. The touchscreen is using some technology that I'm not familiar with; it's not a normal Wacom screen; I tried one of my other Wacom Styluses and it did not work on the E65. The keyboard is tightly crammed, and that would discourage me from taking a lot of notes. If you look at the zoomed in photo, you'll see that I have an azerty keyboard. This was a model for the French, and they localized the keyboard, obviously. The page turn buttons on the right are well placed, but the ones on the left are not. I think it would be better to have left them off and allowed the keyboard more room to spread out. The 2 speakers are on the back upper corners, and the power button, USB port, headphone jack, and stylus slot are on the right edge just below the speaker. The USB and jack are hidden behind a cover, which is irritating. It feels like I have to shove the cover out of the way when I want to plug in the USB cable. There's a cover on the back, and underneath you will find the battery and the microSD card slot. Now this cover was truly a PITA to get on and off. I was afraid each time I messed with it that I would somehow break the screen. It takes a fair amount of lateral pressure to remove and replace, and even when laying flat on a desk I was still worried. It comes with the reading app and an on-device ebookstore, as well as a music player, an image viewer, calendar app, and a sketchpad. I'm going to focus on the latter 2 and cover the reading app elsewhere. But first, there is no web browser (so far as I can tell). It's also not clear if you can hijack the bookstore app and use that as a browser, but i think it might be possible. The calendar app does more than show the dates. You can also scribble a note on the monthly page, or you can select a day and scribble a note there. It doesn't support a weekly view, though. Like the sketchpad app, the calendar app has 5 line thicknesses, 3 eraser thicknesses, and an erase all feature. You can find the notes you scribble in the calendar app in the calendar folder as BMP files. They're sorted by date. The sketchpad is actually called a notepad, but I don't see the ability to type notes. It does support multi-page notes and it offers a number of backgrounds: blank, 4 squares, 1cm grid, lines, blank sheet music, etc. But it also lacks some obvious backgrounds for games like connect-the-dots, tic-tac-toe, hangman, and so on. I am surprised; they would have been easy to include and they would have added a lot of value. The reading app is surprisingly feature rich. The annotation ability is on par with Sony or with the Onyx Boox, it is that good. 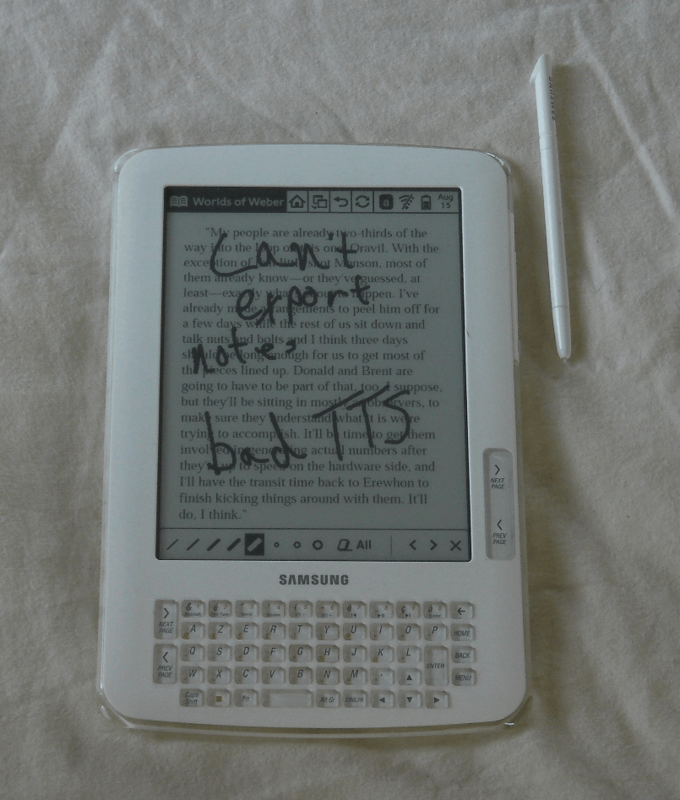 The E65 also offers TOC support, a location bar at the bottom of the screen, on screen page turn buttons, an annotation menu, search, dictionary (highlight, not typing), text to speech, and it offers an extra note space for each ebook (similar to writing on the inside cover of a book). That last is very cool. One key spot where the E65 falls down is exporting the annotations. I don't see where the highlights are stored, but the on screen scribbles are stored as BMP image files. Unfortunately, you don't get the text under the scribbles, so a lot of context is lost. It also fails to use the keyboard as well as it could. You can't type in a note, which is simply stupid (but also common on Kindle clones). The text-to-speech feature would have been great if not for the fact that the K2 came out long before and did it better. The TTS on the E65 would best be described as mechanical and stilted. It inserted long pauses in between the paragraphs and it struggled with what I would have thought were ordinary words. The normal reading experience is okay, but I generally didn't care for reading on E65. The page turns are slow and the general response rate lags behind most devices on the market. The slipperyness of the case also detracted from the experience. This was an interesting experiment on the part of Samsung but they suffered from bad timing. Had this ereader hit the market 6 months earlier, Samsung would have had a good chance to at least fight it out with Sony for 3rd place. As it was, Samsung delayed the release in the US market until just a little too late. This ereader could possibly have been the best ereader of 2009. Had Samsung released this even as late as January 2010, it could have had a serious effect on the market. But it didn't come out until mid 2010, and that was its undoing. It is feature rich, but then so are Android tablets. The Kindle is sold for 139 Euro (Wifi) and 189 Euro (3G) (including 19% VAT) in Germany. The Samsung price is at least in the same range. It’s still on the market? Thanks. Great gadget. More than just ebook reader. It’s just a shame Samsung doesn’t offer any support or firmware upgrade. Had Sony reader, but this one is much better, has many options that rivals don’t have. Bought from ebay as refurbished model for some 70 Euros, some six months ago. Bought this in UK towards end-of 2010 – at that time it was on sale for £100 – so I thought it was a good deal. It is not the most reader friendly ebook reader but I like the fact that you can scribble on it and use it for taking notes. Apart from that – Kindle beats it hands down in pretty much everything else. Saw one used for £20. Still not attractive.